Biography - Frederick W. Risser, M. D.
FREDERICK W. RISSER, M. D. The healing art is one that has many disciples, but comparatively few capable followers. Each spring season sees hundreds of young men turned out from our medical colleges with the degree of M. D. A few of these are at once so fortunate as to step into a good practice. Others spend a short time in seeking for a location, and not being able to wait for the happy chance that shall give them an exercise of their healing ability, turn to some other profession or business, still others patiently woo fortune in their chosen calling until that fickle lady smiles upon their efforts. Our subject has been one of the fortunate ones, for although yet a very young man, his ability and devotion to his calling have been recognized and he has charge of a good practice in the place which he has chosen for his home. When engaged in making mud pies and distilling queer concoctions when a boy, Dr. Risser showed small promise of being the wide-awake and able young physician that he now is. He was born in Troy, Madison County, this State, January 1, 1863. His father, Henry A. Risser, was by birth and parentage a German, but emigrated with his uncle to America when about seven years of age, his parents having both died in Germany prior to his coming to America. On reaching manhood he was married in Chillicothe, Ohio, to Miss Cecelia Zanders, who was born in the Buckeye State. After marriage they began their life together in St. Louis, Mo., where they remained about one year and then settled in Troy, Madison County, this State, of which they have since been residents. The father was engaged there as a merchant. Our subject was brought up in the village of Troy where he remained until he had attained to manhood. He received his education in the Troy schools where he studied until sixteen years of age, after which time he was engaged for three years in teaching school, but during vacations and in the interims of his work he was pursuing his medical studies to which he had determined to devote himself. In the fall of 1882 Mr. Risser entered the St. Louis Medical College and pursued his course for a period of four years, during which he did excellent work. In 1886 he was graduated from the college and received his diploma. Looking about for a good place in which to locate, our subject was charmed with the village of Strasburg and its surrounding country and determined to here build himself up a profession, and in this place he has been ever since the commencement of his career as a professional man. He enjoys an extensive practice and ranks among the best physicians of Shelby County. Broad minded and progressive, he does not recognize any pain or suffering that it is not within the realms of science, at least, to alleviate. He of whom we write was married in Strasburg, October 10, 1888, to Miss Mary Doehring, a daughter of Ernst F. and Mary (Wirth) Doehring, who are residents of Prairie Township. Mrs. Risser was born in Madison County, this State, September 18, 1865. Dr. and Mrs. Risser are the proud parents of one child who bears the sweet Southern name of Nita. She was born August 5, 1889. Our subject and his wife are both members of the Lutheran Church. They are popular young people in Strasburg, taking readily the social position to which their culture and natural advantages entitle them. 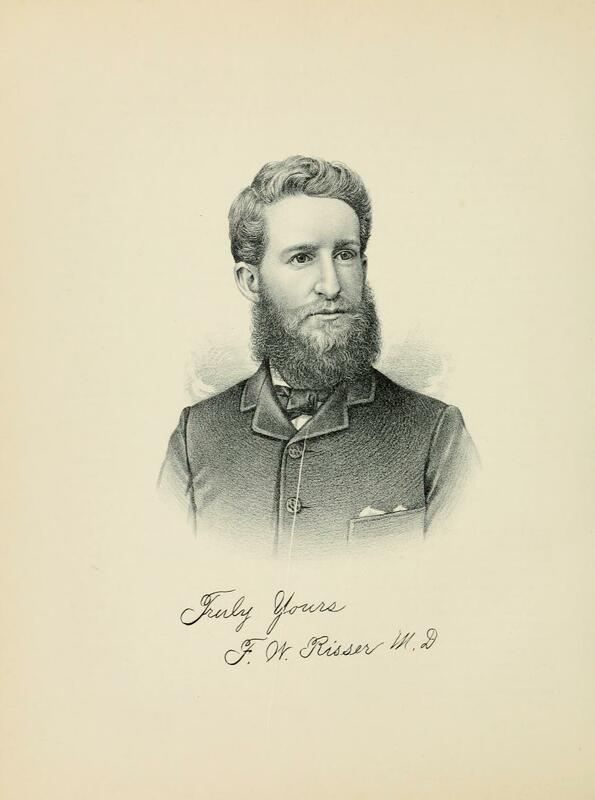 A lithographic portrait of Dr. Risser is presented on another page of this volume. Extracted 11 Jan 2018 by Norma Hass from 1891 Portrait and Biographical Record of Shelby and Moultrie Counties Illinois, pages 336-338.